17: 7 rec., 107 yds, TD. 18: 5 rec., 116 yds, 3 TD. #Packers RB Ty Montgomery is back in the game. So there's one injury apparently avoided. Wow, Montgomery is back in the game. Geronimo Allison on "New York Pass Defense" this week: "Probably won’t be too many handcuffs being passed out this Sunday." Rodgers is 14 of 18 for 207 yards and two touchdowns in the second half. ...And a #LambeauLeap for Rip! Odell Beckham Jr. has caught 4 of 11 targeted passes for 28 yards. They're jumping around with #Packers leading 38-13 at the 2-minute warning. One hell of a way to close out Lambeau Field this season. That Kentrell Brice dive was the play of the game. Wonderfully epic. 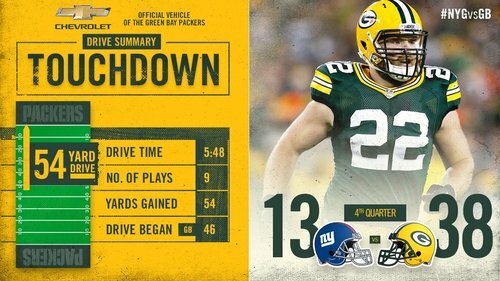 During the #Packers ’ seven-game winning streak, Rodgers is 167 of 240 (69.6%) for 2,029 yards with 19 TDs and zero INTs for a 121.7 rating. Noble effort, Damarious Randall. He left it all out there on the field. The #Packers are movin' on to the NFC Divisional playoffs! 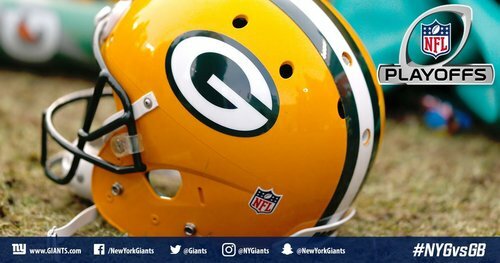 Final: #Packers 38, Giants 13. They're heading to Dallas, back in the NFC divisional round for third straight year. #Packers were up 14-13 after the failed fourth-down play and ensuing touchdown. And they win 38-13. 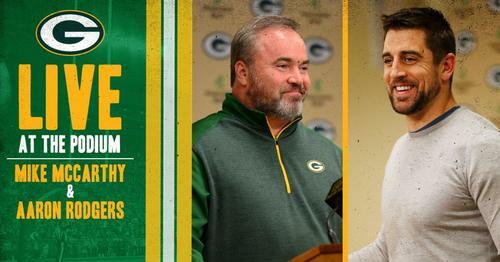 Hear from Coach McCarthy, @AaronRodgers12 & @rcobb18 live after the playoff win! Coach McAdoo: Give Green Bay credit, they played well tonight and we struggled to be consistent in all three phases. 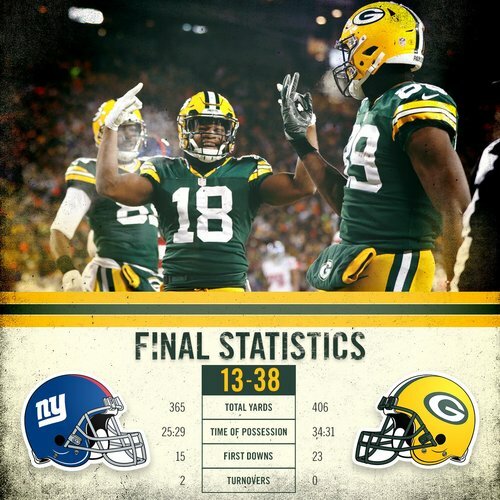 #Packers top Giants, 38-13, in wild-card round! Coach McAdoo on DRC injury: We have other guys that we're confident in but it wasn't the deciding factor in the game. 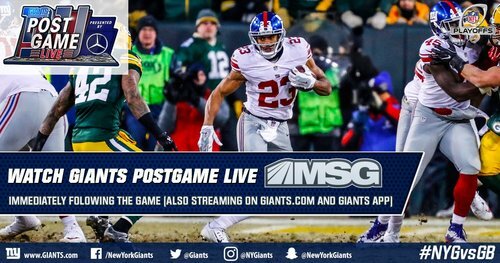 Coach McAdoo: The guys were dialed in and played with tremendous credit...give Green Bay credit. McCarthy: Excellent playoff victory for us. 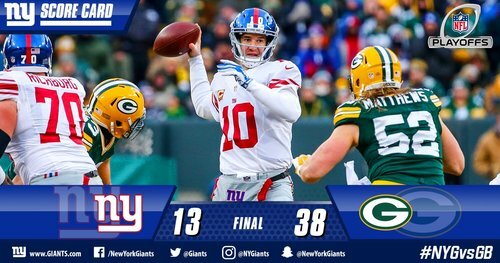 Played an outstanding team in the Giants. We knew it was going to be a battle. McCarthy on Hail Mary: We practice these every Saturday...Throwing the ball with arc is the key. Big play, obviously gave us momentum. 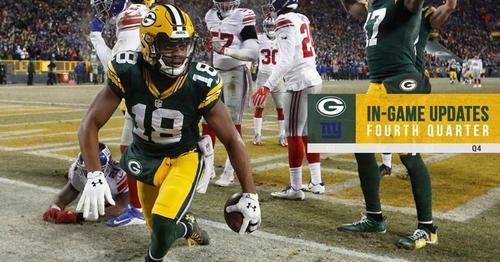 McCarthy on Randall Cobb's big game: Tells you so much about him & the connection he has with Aaron. Great to have him out there. McCarthy: Obviously have concern for Jordy (Nelson). Don't have an update yet. McCarthy on @AaronRodgers12 : He's playing tremendous football. He's spoiled all of us around here for a long time. #Packers coach Mike McCarthy said he "has concern" for Jordy Nelson (ribs) but does not have an update on his condition. Final stats from today's win!